We are looking for new lab members! We are currently looking for a postdoc with experience in genomics to conduct research into novel chromatin interaction methodologies, as well as Research Assistants with biology and/or bioinformatics background who are interested in pursuing PhDs at a later stage. This entry was posted in Lab Members on November 27, 2013 by M.
After serving as Secretary last year, and council member the year before, Melissa has been elected as President of the Singapore Institute of Biology (SIBiol). For more details, please click on this link. This entry was posted in Lab Life on November 24, 2013 by M.
Melissa will give a talk at the Genomics Research Asia conference held at Biopolis, Singapore on Tuesday, 12 November at 2.15 pm. 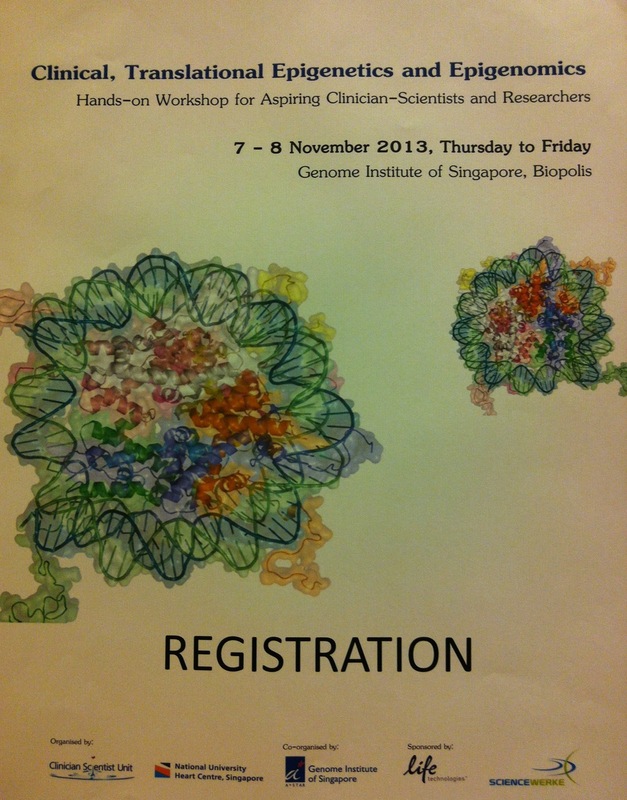 This entry was posted in Talks on November 9, 2013 by M.
Melissa gave a talk and hands-on demonstration involving browsing the ENCODE data today at the workshop for Clinicians organized by Prof. Roger Foo (CVRI and GIS) and the Clinician Scientist Unit, held at the Genome Institute of Singapore. This entry was posted in Talks on November 8, 2013 by M.
Welcome to the lab, Christian! A warm welcome to Christian, an undergraduate from Yale-NUS who is working with us as a part-time lab assistant. This entry was posted in Lab Members on November 4, 2013 by M.
Welcome to the lab, Xu Chang! We’d like to welcome Xu Chang, a PhD rotation student, to the lab!